‘Tis the season of thanksgiving…rolling around once again. While we’re trying to close end-of-year sales, allocate budget numbers and ship those last-minute orders, we also need to be giving thanks to the people who make our business happen. That’s not just our customers. Sure, thanking them for their business will help keep their orders coming in, but the real people who should be getting the bulk of our gratitude are our employees. The people who work on the line every day picking, sorting, packing and loading are the ones you need to thank – not just in passing, but in a full-blown, can’t-be-missed way. If you’ve been showing your gratitude throughout the year, this may not be such a gargantuan task. You’ve laid the groundwork for appreciation. But if you’re not the type to have said, “Joe, thank you for your work today,” then you should consider the results of doing so.  Appreciation – an appreciated employee is a loyal employee. People like to feel appreciated. They want to know that you noticed that they are coming to work earlier and taking a shorter lunch break in order to get a big project completed. They want to know that you are happy with the job they are doing overall – whether it’s packing boxes onto a tractor trailer or making a presentation to a board room full of people, even though they’re on your time (payroll, that is), they are still on their time. If an employee doesn’t go above and beyond, they should still be appreciated. A few words like, “I appreciate your patience,” or “I appreciate your promptness,” can go a long way. If employees feel they are doing their jobs without getting any feedback, they won’t stick around long. On the other hand, if you show your appreciation, even on the mundane tasks, you’ll find that people will have an affinity for you. They will stand up for you in discussions, they will give you the benefit of the doubt in a questionable situation. If they are truly appreciated, they will be loyal to you.  Autonomy – an autonomous employee makes better decisions and shares more ideas. If every time you shared an idea you were met with scowls or reasons why it won’t work, after a while, wouldn’t you stop sharing your ideas? If your boss told you exactly how to do a project, then second-guessed your every move, would you put forth any fresh ideas or procedures? Probably not. Those employees who are self-motivated and who work well independently should be given the chance to make decisions and share ideas. They will do so more readily when they are allowed to make those decisions and live with the outcomes. The outcomes might not always be positive, but they will be a direct result of the employee’s decision. A good place to start is with customer service. Give the front-line people – those who are on the phone with the customer– the authority to make a decision on a certain level. Whether it’s saying, “I can’t give you your money back, Mr. Customer, but what I can do is…” or “I can approve up to $1,000 in refund money, but anything higher must be signed off by my supervisor,” you’re giving the employee some control. They are more than a telephone operator, they are a participant in your business. 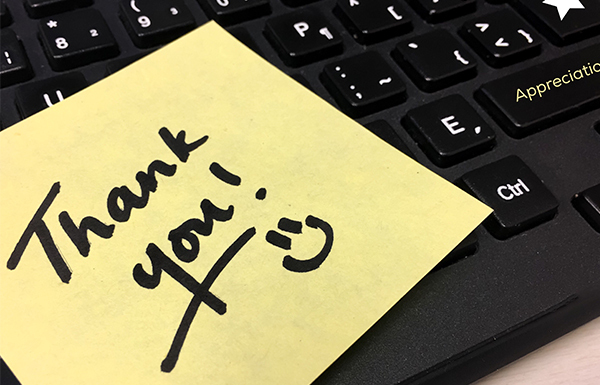 By sincerely thanking people, you’re instilling a confidence that the employee can do more. Also, if the employee can solve problems, that’s fewer problems in your in box!  Gratitude – a grateful employee cares about the quality of his or her work. This, in turn, is good for your company’s business. If you show gratitude to your employees, and demonstrate in both words and actions that they are an important part of your success, they will be grateful to you. When we’re thankful, we are appreciative and foster that appreciation and gratitude in others – it’s contagious! This season, don’t forget to recognize every employee – whether it’s a bonus check or a recognition of their work, if it’s authentic and sincere, it will go a long way.